You will want to start this process about two years before your con, especially if you live in a city that hosts a lot of conventions. You may wish to focus on smaller hotels so you won’t find yourself competing for meeting rooms with larger groups and so yours will be “the” convention in the hotel on your given weekend. Ideally, that will mean greater attention to your needs from the hotel. It’s possible your city has a tourist board that provides convention runners assistance in weeding out hotels that might not be a good fit or might not be able to host your convention. They might ask you for your requirements and send out a Request for Proposals to many hotels in your area, and provide you with the resulting information about which hotels might be interested. This could help you a lot in winnowing out what might otherwise have been unproductive contacts as you begin your selection process. When deciding on hotels, you may have to balance relative cost with relative convenience. You may easily find a hotel in an area outside of the city for really low room rates, but with no amenities close by, making cab rides or rental cars a necessity for the fans (consider especially the distance to/from the airport and whether the hotel may have a free shuttle). A slightly more expensive venue may be near a trolley stop and/or tourist attractions or near a mall with lots of dining choices. Only you can determine the overall value of a hotel, but keep in mind that price is only one component to factor into consideration. Traditionally, our U.S. conventions are held in mid-July. This may mean that in some parts of the U.S. you will not be hosting a con during “high season,” while in others, you may. Many fans who regularly attend our fan-run conventions expect each year’s con to be held in mid-July, so out of consideration for that tradition and, most importantly, to maximize your attendance, you may want to consider the traditional timeframe to be more important than the relative cost to hold a convention at another time of year. Ideally you’ll lock in your hotel and sign a contract before you calculate your con registration costs to ensure you charge enough for registration (or close to enough) to cover your liability to the hotel. Check web rates prior to your meetings. This will give you an example of the lower rates the hotel might be willing to negotiate with you. It’s strongly recommended that you use tripadvisor.com to assist you in your hotel selection by getting information on what travelers’ experiences are at particular hotels you might be considering. This could help you select or eliminate properties based on reviews; obviously, you would hope to find more positive reviews than negative ones for properties you are considering. Also, some hotel chains (e.g., Marriott, Hilton) have tools that will search an entire area for hotels in their brand with meeting room needs that you specify, which can be a timesaver in weeding out hotels that won’t work. But even if you can’t find such tools, often hotel websites will have space charts and floor plans for meeting spaces; look for words like Plan an Event, or Meetings, or Weddings, or the like. As you do your on-site visits to potential con hotels, keep a notebook with a list of questions with you and write down the answers given. Once you’ve seen a couple of hotels, you probably won’t be able to keep the various answers from each straight if you just rely on memory, and your notes will be lifesavers. Take photos if they’ll let you. This is also helpful in comparing hotels. Ideally you don’t want to have to pay for the meeting space. Hotels generally offset the cost of the meeting room by requiring minimum room blocks or by requiring a certain dollar amount for catering per day or per length of convention. Is the meeting space available on the weekend you want to hold the convention? Can you place the stage anywhere? Are plugs available where you want the stage/if you need plugs to operate tech directed towards the stage/screen? Does the laptop have to be in a certain place in the room for all the “hook-ups”? How much time does the hotel staff need to set up for a banquet if tables are already in the meeting room? Will they ensure the hotel doesn’t move your gathering from your preferred meeting space to another meeting space? What is the availability of other tables to be placed along the room’s side walls (allowing extra space for chairs to be placed behind them)? Do these tables cost extra? (No electrical outlets are usually needed behind these tables, just table/linens covering the tables/a few chairs). IMPORTANT NOTE: You would want a minimum of 8-10 rectangular tables in addition to banquet tables in the room, not counting food service tables or water station. Where would tables for food service [if planning for a buffet meal] and daily water station go? Will they provide at least two large trash receptacles and will they be emptied more than once a day? Air conditioning for the meeting room - who controls this? If hotel staff, will they respond to requests to lower or raise the temperature? Are there dimmers on the overhead/wall lights? Can you do a brief candle-lighting (is that OK with fire regulations)? Can you get into the meeting room at least the night (if not the afternoon) before the convention begins to set up? Is there a smaller room to store boxes in prior to moving into the convention space, and/or to use in addition to the convention space? How late can we stay in the convention room in the evening? How much time can you have after closing ceremonies on Sunday to clear everything brought to the convention out of the convention space? How secure is the meeting room/storage room and can you get a key? If a key can’t be provided, how quickly will staff come to unlock the door at your request? Can they ensure the hotel staff will NOT let anyone else but you or your designated alternate request that the doors be unlocked/locked? If possible, take photos inside the meeting room where the stage might be placed so you can see what happens when you do – is the light over the stage adequate to take good photos from the audience? Are there windows which glare into the cameras of attendees/obscure the face of someone on the stage? If so, are blackout drapes available? Are there ample hotel rooms available for the convention time period? What’s the single/double occupancy rate for a convention group of the size you expect? Is that a better rate than fans can get booking on their own? Is there an extra cost for a 3rd or 4th person in a hotel room? Are renovations scheduled at the hotel during your convention period? NOTE: Some hotels separate catering requirements from room block numbers, some don’t. A room block is the total number of rooms you want the hotel to set aside for EACH night of your gathering – pre- and post-convention as well as during the convention. [As an example, if you and three other fans stay together in one hotel room for seven nights, that’s ONE room in your block for each night.] In general, the nights of the convention itself generate more room nights than pre- and post-con nights. space cost: If the number of room nights booked correlates to a reduction in the cost of the meeting space, what number is required to get the meeting room "free"? And is that a per-night room block requirement, or a total of room nights booked for the length of the convention period? How long does the special room rate run [request it for pre-con and post-con nights when you’ve planned activities around your convention weekend]? Can all the rooms in your block be located in the same part of the hotel/same floor? Can you work with the hotel to assign specific rooms to specific people in advance? Are there any connecting rooms available for fans who wish them? If so, how many? Are refrigerators provided or do they cost extra? If the latter, how early must fans book them? The same with microwaves. Is there free WiFi in the hotel rooms? Is there a non-refundable deposit you must make once you sign a contract? If so, how much, and when is it due? Can there be a payment schedule? What is their cancellation fee schedule? In recent years (since 2001, actually), conventions have provided more meals to fans than just the Saturday banquet meal. It’s become an expected part of a B&B convention. While you don’t have to provide every meal during the con, you may find you are expected by the hotel to spend thousands of dollars on catering to get your meeting room for free or at a reduced rate, so you will likely provide some meals. Offering to spend more on catering may get you more freebies from the hotel, so catering costs become part of your negotiation strategy. Keep in mind you want to spend your money where the fans “see” it – it may be penny wise and pound foolish to spend money on meeting room rentals instead of catering, because the fans will expect the meeting rooms as a matter of course, but will really appreciate not having to shell out extra for a meal (and not having to leave the hotel and find a restaurant, etc.). Buffets are cheaper than sit-down (“plated”) meals. The hotel may have day-long-meeting packages that include light breakfasts and lunch or a snack, and which are cheaper than separately priced meals and snacks. The hotel will have sample meal options, printed out on glossy paper, but keep in mind these are not take-it-or-leave-it options. Very likely they will work with you to customize what’s offered to fit your needs. Ask. Negotiate. Do trade-offs with food (e.g., drop soup from a meal to save a dollar or two per person, or negotiate for a cheaper dessert option, or fewer salads on a lunch buffet). It is sometimes the case that a hotel will charge you the cost of the priciest meal option for each plated meal, so if you offer, say, a steak option, a fish option, and a pasta option, with the steak option costing $5 more than the others, they might plan to charge you the “steak option” price for all your banquet meals, no matter how many other-than-steak options are selected by your attendees. Ask about this before you offer a pricey option! 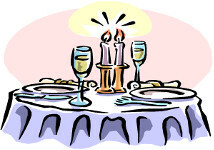 Remember, you will be charged tax and service charges on top of your catering costs. This can easily add one-third to your catering bill (and is usually NOT counted in the catering amount negotiated in the contract). NOTE: Keeping the fans in the hotel for meals has another advantage – higher attendance during the convention, as fans won’t be as likely/have reason to wander away when they know a meal is going to be offered. This translates into more people participating in events, more folks playing Beast Bingo, etc. Ultimately, it could translate into more money for the con charity. Think of ways to keep people “in their seats,” and feeding them is one big one! The hotel should be able to provide you with a catering menu. Ask for it if they don’t offer it to you. What amount are you expected to spend on catering (food & beverage service)? Are there per-day food/beverage minimums in effect? Or can your catering requirement be spread across the days of the convention as long as you ultimately spend your overall requirement? [For example, a sit-down banquet may exceed the per-day requirement, while providing a buffet lunch on another day may not quite come up to the per-day requirement - ask if you can negotiate on that.] IMPORTANT NOTE: Hotels do not count the amount they charge for service charges/tax as fulfilling part of your catering requirement. Ask if you can lock in prices for catering or at least contract to pay no more than X price increase. Ask if a free breakfast is included in the hotel room price. If you order a buffet, ask how long the buffet will be left out. Generally one hour is sufficient. Re: banquet tables – what are the color options for table linens? How often are the tablecloths changed? Are there set-up or changing fees? Can you have a permanent water station, refreshed periodically during the convention days? How often will dirty-dish clean-up be done in the meeting space? How flexible is the catering department for food issues (vegan, gluten-free, food allergies)? Check out the lobby – is it inviting? Is there a lot of seating? How far are the hotel rooms from the meeting space? Do fans have to walk from one building to another to get from hotel rooms to the meeting space? Are there major events in the city the weekend you want to have your convention which might impact room availability, room cost, etc.? Does the hotel offer a free airport shuttle? If not, can they provide discount coupons for shuttles or other options? If not, what is the average cost of a taxi or shuttle to the hotel from the airport? How close is the hotel to a trolley or other transportation? Does their hotel shuttle offer amenities besides airport transport [e.g., transport to close-by tourist attractions/stores]? Can you get more than one meeting room, i.e., a smaller room for storage/staging or for display or breakout meetings? What is the shipping/receiving policy at the hotel? Are there special requirements (e.g., no packages accepted until one day prior to the convention) or size restrictions? Will the hotel allow you to bring audio-visual equipment in yourself? If so, is there an access fee involved? Does the hotel offer audio-visual services or equipment for rental (mics, DVD players, screen, etc.)? Can you negotiate the free use of any of those things (for instance, through a larger catering commitment)? Does the hotel have display equipment for rent, and if so, a price list? Is hotel parking free or available to guests at a reduced rate? Are there in/out privileges for guests? Is there a business center available? With a printer? Copier? Can you move goods to/from the meeting room on your own (using hotel carts), or is there a requirement to use hotel staff to move items? Can you have a sign outside the door of the room or a board on a stand put up for notices during the convention period? Is there a hotel restaurant that is open for breakfast, lunch, and/or dinner? What other dining options are nearby? You may want to provide fans with a list of these once you select a hotel, so they are aware of options prior to coming to the convention. Is the neighborhood surrounding the hotel safe? Is it a quiet neighborhood? If noisy, are the hotel rooms adequately soundproof? IMPORTANT NOTE: All this advice pre-supposes that you, or at least one core member of your con team, are located in the city in which you wish to hold a convention. It is immeasurably difficult to coordinate a convention in a hotel you cannot personally visit, not to mention the difficulties with logistics in trying to bring in dozens of boxes of con materials to the hotel at a time when the hotel will accept them (hotels generally do not provide storage facilities). Talk to any past con chair about shipping costs, the number of boxes they transported to the convention hotel the day before their convention, etc., to get a feel for how much pre-staging is involved for a convention. Once you’ve selected the hotel that best meets your needs, don’t lay all your cards on the table at once. If you know the hotel requires $X in catering for the meeting space to be free to you, and you know you plan to spend $X + $Y on catering, agree to spend $X at first, then use that extra as leverage to negotiate free stuff. For example, could you get additional meeting space (or a lower rate on the convention space) if you up the catering by $Y? Will the hotel let you have the stage and/or screen free if you up the catering amount you will spend, or if you increase your room block? You definitely want to negotiate a lower room rate for your room block than is available online. If your contract stipulates you must meet your room block or pay for rooms yourself, ensure that fans indicate they’ve booked a room when they register for the con – your hotel contact should be able to confirm this for you. You want them IN the room block to cover your contracted-for minimum. It might be helpful to ask recent con chairs how many room nights were booked in their block for their conventions, to help you determine how many rooms should be in your block on each night of your booking. ANYthing you negotiate that’s not a standard clause in a contract should be in WRITING in the contract. Oral promises mean nothing. Most likely the person you begin your hotel process with will have left the hotel’s employ by the time the convention rolls around. Some con chairs have had 2 or 3 contact changes between contract negotiations and convention time! New hotel contacts have only what’s written IN the contract in their files to go by. IMPORTANT NOTE: There is no substitute for being there! You will not only get a better feel for how accommodating and cooperative the hotel staff will be, for the vibe of the hotel, and myriad other observations that cannot be made on a long-distance basis, you need to be close by in order to keep in contact on a routine basis with the hotel contact person (especially if that person changes). Nothing beats in-person relationships for negotiations and discussions with the catering staff on meal options. Review, review, review! Go line by line, and don’t be afraid to ask if you don’t understand something. The hotel will have a standard contract form they will hand you as if all you need to do is sign it, but that doesn’t mean you can’t ask for amendments. Don’t be intimidated just because it’s in print! Take it home and look it over. Check the dates for your convention on the draft contract (you would be surprised how many times that information is slightly off in the first iteration of a contract). Check your contact information, the name of your convention, the hours the meeting room will be available – anything they add to personalize the standard contract. One fairly standard item that you can request a change about is when payments are due to the hotel. Occasionally a contract calls for payment up front, and it’s possible to negotiate smaller payments over a longer period of time. Of course, the hotel would love to get all their money early, but usually they easily agree to stagger payments. If you’ve negotiated something, make sure the contract reflects it or is amended appropriately. Sometimes you go back and forth on the contract several times before it’s finalized to your liking. Don’t be afraid to ask for changes. You are liable for whatever you sign, so make sure it’s correct! It would help you to look over contracts signed by previous con organizers, or (even better) to run your draft contract by prior con organizers, for hints. If you look at prior contracts, one thing you will note is that nothing seems to be standard! Some hotels will require a certain level of room nights to get the meeting space for free, others will focus on catering. Some will require your catering requirement to be spread out over several days, others won’t care if you spend it all at one meal. You might get some ideas about what to negotiate for by reading others’ contracts and/or talking with previous con chairs. You likely will be on the hook for several thousands of dollars with the hotel from the beginning, and will sign a contract promising to spend a certain amount for catering. All this will be done prior to you advertising your convention and actually getting registration money. You may decide to invest in an insurance policy covering situations beyond your control. If a hotel will not amend a contract to include something they have promised you orally, that could be a problem, depending upon what that thing is. Sometimes it’s a corporate thing, and your hotel contact doesn’t have discretion to amend that item. However, always remember that almost no con chair has gone from initial negotiation to actual con dates with the same contact person at the hotel. One person leaves and the next person has no idea what you’re talking about if you tell them the previous contact person promised you X or Y – so have it put in the contract if it’s something important you negotiated and if it's at all possible to do so. If there’s a clause you don’t like (for example, a requirement that you must hire an outside security company at the hotel’s discretion) and they tell you not to worry, that they won’t activate that clause, but you feel the least bit concerned, you may decide that hotel is not for you. Listen to your gut, because you are signing a legal contract. Ensure your hotel contact will provide you with a list names of those who have rooms reserved in your block, and will update the list for you routinely (say, once a month or so) so that you know how close you are to filling your block, and when you should begin asking to extend it. Ideally, you would extend the block BEFORE fans advise you the hotel has told them the block is full.